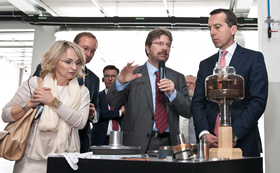 Dr Andreas Lackner, executive director of Plansee SE and Austrian chancellor Christian Kern with Plansee components for modern medical devices. Powder provider Plansee says that it is investing €10 million to build a new production line for medical engineering products. The official launch of this largest single investment at the Breitenwang/Reutte site in 2017 took place today in the presence of Austrian Chancellor Christian Kern. Plansee's largest production site, Reutte, has already been manufacturing medical engineering products for over 60 years. The components are installed in X-ray machines and CT scanners. The company now plans to set upan automated, networked production line that should be fully installed within 12 months. ‘We want to continue to produce medical engineering products highly competitively in the heart of Europe in the years to come,’ said Bernhard Schretter, member of the board of directors of Plansee Holding AG. In total, Plansee and Ceratizit have invested €46 million in their Breitenwang/Reutte site in the last financial year 2016/17. Investments on a similar scale are planned for 2017.